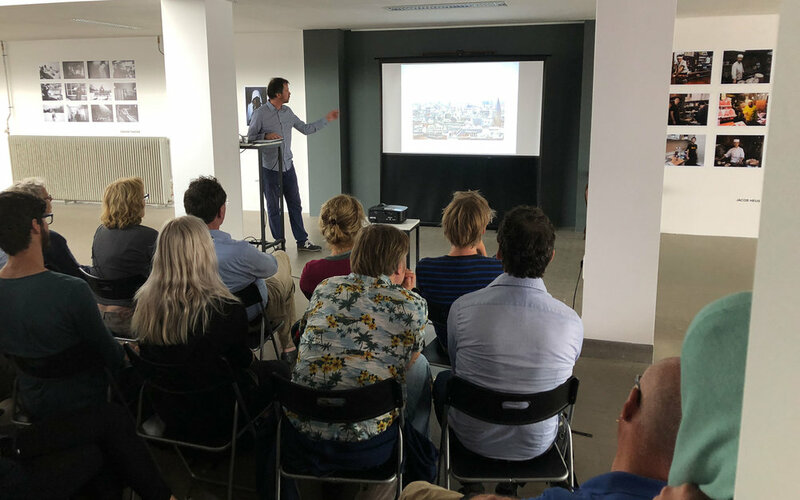 The exhibition Pixel Brick Fiction was officially opened with a lecture by Filip Dujardin on his approach to architecture photography and how that has evolved into a burgeoning artistic practice of architectural installations. Particularly important for Dujardin are not only the possibilities afforded by the digital medium used for photographic manipulation, but also how those are reflected on material construction. As he composes imaginary architectural compositions, he constantly alludes to the passage of time and the presence (or specter) of the individual, without explicitly introducing them. Their presence (and absence) are a running theme in creating Dujardin’s impossible realities, noticeable upon closer inspection. His exploration of digital and material architecture culminates with his particular fascination on the plasticity afforded to both by simply manipulating their respective basic component, namely the pixel and the brick. Directly addressing the exhibition, Dujardin discussed the images on display and reflected on the expansion of their meaning through the translation and deconstruction performed in the gallery. Appropriately, it was this space of doubt and ambiguity that his images aimed to occupy and that was now being explored by the material in the exhibition.